All the accommodation types at Hôtel Atmosphères are individually decorated and feature carpeted floors, a flat-screen TV with cable channels and free Wi-Fi. 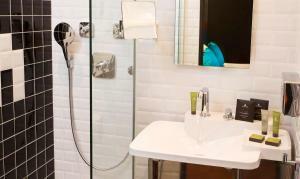 A private bathroom with free toiletries and a shower is also available. Breakfast is served every morning at Hôtel Atmosphères. The property has a bar and restaurants can be found within 200 metres of the hotel. This property is 200 metres from Maubert Mutualité Metro station and Notre-Dame Cathedral is an 8-minute walk away. Parking is possible on site at an additional cost. Upon arrival, guests must present the same credit card that was used to make the original booking. Guests are required to show a photo identification and credit card upon check-in. Please note that all Special Requests are subject to availability and additional charges may apply. This air-conditioned room offers carpeted floors, a flat-screen TV with cable channels and a private bathroom with free toiletries and a shower. Rate: € 145.35 ... € 428.40; select dates below to get current rates. This larger, air-conditioned room offers carpeted floors, a flat-screen TV with cable channels and a private bathroom with free toiletries and a shower. This spacious, air-conditioned room offers carpeted floors, a flat-screen TV with cable channels and a private bathroom with free toiletries and a shower. This air-conditioned suite offers carpeted floors, a flat-screen TV with cable channels and a private bathroom with free toiletries and a shower. This spacious, air-conditioned suite offers carpeted floors, a flat-screen TV with cable channels and a private bathroom with free toiletries and a shower. This air-conditioned suite offers a flat-screen TV with cable channels, free Wi-Fi and a private bathroom with free toiletries, a hairdryer and a shower.